Anyone else remember when Tim Allen ruled the world? He enjoyed an awfully good run back in the mid-Nineties. While Home Improvement rode high on the TV ratings charts, Allen broadened his horizons into the world of movies. He provided a lead voice for 1995’s biggest hit, Toy Story, and he also starred in 1994’s holiday hit The Santa Clause. Allen never recovered the box office clout he displayed with that $144 million success. In fact, Allen didn’t star in another movie until 1997’s flop Jungle 2 Jungle. 1999 offered a rebound for him with Toy Story 2 and the modest hit Galaxy Quest, but Allen’s days as a major star seem to be behind him. Nonetheless, he still enjoyed a nice time at the top, and Clause remains a reasonably popular Christmas flick. At least it did well enough to generate a pair of sequels. In Clause, we meet successful toy executive Scott Calvin (Allen). He divorced his wife Laura (Wendy Crewson) and gets sporadic visitation with son Charlie (Eric Lloyd). Charlie doesn’t seem wild about these occasions, and he wants to make their Christmas Eve time together as brief as possible. The situation doesn’t go well, and they get a jolt when a stranger lands on their roof. Though Charlie knows it’s Santa, Scott doubts. When he startles the interloper, Santa falls from the roof and becomes injured. At Charlie’s urging, Scott puts on the suit and takes Santa’s place. This sends them on a wild ride to deliver toys, and they also end up at the North Pole. Head elf Bernard (David Krumholtz) educates Scott about “the Santa Clause”; when Scott donned the outfit, he legally accepted the responsibility to take over the job as Mr. Kringle. When he returns home the next morning, Scott tries to deny the events of the prior evening. However, Charlie becomes obsessed with his dad’s Santa status, which negatively affects the situation. Laura and new husband Neal (Judge Reinhold) – a psychiatrist – fear that Charlie’s losing his grip on reality, and they don’t like the way that Scott seems to encourage those thoughts. Scott initially fights the situation, but eventually he accepts it and then goes through physical changes that turn him into our generally accepted image of Santa. For a movie called The Santa Clause, this one spends surprisingly little time dealing with Christmas. Granted, the Santa theme remains constantly in play, but in truth, Clause deals more with the drama related to fractured family dynamics than with St. Nick’s issues. While Scott always remains our main character, the film emphasizes the topics that relate to Charlie. This approach doesn’t seem very successful, partially due to the unlikable presence of young Lloyd. He offers a precocious and petulant personality that consistently annoys. The film’s many other young performers – most of whom play elves – don’t provide very strong actors either, but at least they don’t seem as obnoxious as Lloyd. His weak work creates a hole in the center of the film. Since so much of the movie emphasizes Charlie, that causes problems, but Allen’s generally genial and engaging presence helps. He doesn’t do anything particularly special, but he seems up to the role’s minor demands, and he allows the movie’s gentle humor to come across acceptably well. His best moments occur when he starts to get into the Santa part; one fun scene shows him at work, where he opposes the same cynical toy marketing he supported for so long. Probably the film’s best performance comes from Reinhold as psychiatrist Neal. He creates an amusingly stereotypical take on a shrink that seems broad but entertaining. Neal acts as the flick’s de facto bad guy, but Reinhold creates such a gentle and unassuming character that he provides some nice moments. While parts of Clause work well, I think the filmmakers try way too hard to give it a mystical aura. The movie pours on sparkly glop like a crummy New Age song from Loreena McKennitt – I’d forgotten how much I hated her “music” - and it attempts to force magic when it can’t deliver. The movie does bring about a feeling of an idealized Christmas setting at times, but during others, it works too hard to enchant us. Ultimately, parts of The Santa Clause seem moderately amusing and entertaining, but other aspects fall flat. Some weak performances from child actors harm it, as do forced attempts to create a magical aura it can’t naturally deliver. In the end, the flick offers some fun bits, but it comes across as too drippy and sappy to become a total success. 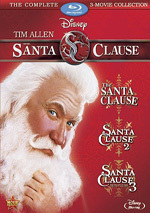 The Santa Clause appears in an aspect ratio of approximately 1.85:1 on this Blu-ray Disc. Though the image showed its age, it accurately represented the source material. Sharpness seemed solid, so the movie presented a pretty crisp and accurate image. I noticed no distinctive signs of softness or fuzziness, as the flick stayed reasonably distinct and detailed; mid-90s movies can look flat, and that occurred here, but I still felt pleased with definition. Jagged edges and shimmering caused no concerns, and I also noticed no edge haloes. I got no sense of digital noise reduction here, as the movie came with prominent grain. Print flaws weren’t a factor in this clean presentation. Colors offered a strong aspect of the transfer. The movie featured appropriately bright Christmas tones, and the disc replicated them nicely. Granted, the bland mid-90s stock and the grain dulled them somewhat, but the hues were still pretty peppy. Black levels came across as dense and dark, and shadows were fairly smooth and clear. No one will mistake this for demo-level visuals, but the Blu-ray provided an appropriate representation of the flick. I felt the same way toward the DTS-HD MA 5.1 soundtrack of The Santa Clause. Not surprisingly, the soundfield maintained a general emphasis in the forward spectrum. Music showed fairly solid stereo imaging, and effects offered a nice sense of atmosphere.. As I noted, the front channels dominated, but the rear speakers also added some useful information at times. They reinforced the music well, and a reasonable amount of unique effects also popped up from the rear. In general, the soundfield was engaging and appropriate for the material. Audio quality came across as positive. Speech seemed warm and natural, and I noticed no issues related to intelligibility or edginess. Effects appeared realistic and accurate. They packed a nice punch when appropriate, and they displayed no distortion problems. Music seemed bright and rich, and the score also showed nice bass response. 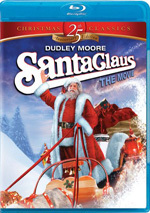 Though modest in scope for the most part, the audio of The Santa Clause appeared very good. This wasn’t a movie from which I expected killer sound, but it achieved its goals. How does the Blu-ray compare to the 2002 Special Edition DVD? The audio seemed clearer and more impactful, and it also corrected some odd balance issues. As for the visuals, the Blu-ray was cleaner, tighter and more dynamic in general. This was a nice step up from the DVD. The Blu-ray replicates most of the prior DVD’s extras. So You Wanna Be An Elf? provides a six-minute and 30-second “examination” of the processes through which new elves must go. Featuring David Krumholtz as Bernard, this piece gives us a cutesy document of this “training”. It’s generally lame and pointless, though at least it tosses in a few shots from the set of Clause. For budding chefs, we find Making Santa Snacks With Wolfgang, a program that teaches us how to make some different eats. This includes three video segments that last a total of 15 minutes, 41 seconds, and illustrate how to make Wolfgang Puck’s pizza, classic Christmas cookies, and Santa’s favorite cocoa. In addition, we get text recipes for those items and also discover measurement conversion charts. As for the video programs, they offer an obnoxious presentation. Puck cooks with some kids in Christmas garb, which seems fine. However, the post-production pours on goofy sound effects and extraneous animation, all of which make the clips almost unbearable to watch. The cooking tips might be useful for kids, but I found the pieces annoying. Though the Blu-ray omits a trivia game from the last DVD, it does come with that contest’s reward: a “Silly Symphony” from 1933. The Night Before Christmas lasts seven minutes, 55 seconds and is absurdly cutesy, but it still makes a nice addition to the package. The Blu-ray opens with ads for Wreck-It Ralph and The Odd Life of Timothy Green. These also appear under Sneak Peeks along with clips for Finding Nemo and Peter Pan. No trailer for Clause shows up here. Although it doesn’t match up with the best Christmas movies, The Santa Clause offers a generally entertaining piece. It suffers from some obnoxious child actors and excessive sentimentality, but it includes enough amusing moments to work as family viewing. The Blu-ray boasts pretty good picture and audio but doesn’t include substantial supplements. Though I wish this set offered stronger bonus materials, at least it replicates the movie itself in a pleasing manner. 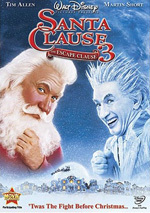 Note that you can buy Santa Clause on its own or as part of the “Santa Clause Complete 3-Movie Collection”. That one also includes the film’s two sequels and offers a discount for fans who want to get all three.